Following a national search, Emory's own George Henry Grant, MDiv, PhD, has been named executive director of the Emory Center for Pastoral Services. The scope of his work will encompass the spiritual health of patients, families and the staff of Emory Healthcare, at all of its hospitals and clinics. Since 2007, Grant has served as the director of research and innovation at the Emory Center for Pastoral Services. His research has involved the practice component of spiritual health to palliative care and end-of-life decision-making. 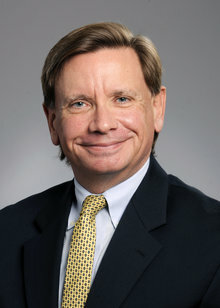 He currently holds faculty appointments in Emory's Nell Hodgson Woodruff School of Nursing and Candler School of Theology and remotely, the University of Washington School of Medicine in Bioethics and Humanities. The Emory Center for Pastoral Services, which was established nearly 45 years ago, is comprised of 30 full-time chaplains and support staff and 20 full-time chaplain residents. The residents are post-graduate Masters of Divinity students training for board certification, and are assigned to provide spiritual care services across the Emory Healthcare system. About 30 to 40 part-time chaplain interns also work within the center. "We respond to patients, family and staff by caring for the whole person through every stage of health," says Grant. "By offering support groups, workshops, meditation and prayer services, along with other forms of integrative practices, we care for the spiritual health of all people, regardless of faith or culture." Along with comprehensive religious, spiritual and emotional care, the center and its staff respond to situations involving ethics, moral distress, work-life and home-life stressors and all health emergencies. Grant is a United Methodist minister originally from South Carolina. He earned a Bachelor's degree at Wofford College, a Master of Divinity degree at Emory's Candler School of Theology and a PhD in Pastoral Psychology from Boston University. He succeeds Elwood "Woody" Spackman, MDiv, who retired from Emory in Dec. 2013 after 28 years of service.